I love a good before and after! When I’m scrolling through Pinterest, it’s one of my favourite things to see. Back in mid-August of 2012 we moved just around the corner from one home to the next. It was the craziest move and we probably should have rented a truck for everything instead of taking things over load by load…50+ loads later!! Anyways! Right away we got started on the interior and the total renovations took us about two months on the main floor. I think the paint was still drying as we were welcoming people for our Canadian Thanksgiving in October. We ripped out ceramic flooring, stained hardwood floors, painted walls and cabinets, replaced faucets, a sink, backsplash and counter tops and did a bunch of work on the house. As you’ll see, I’m not a beige-kinda-person. I love grey (and now loving greige…but more on that in another post). 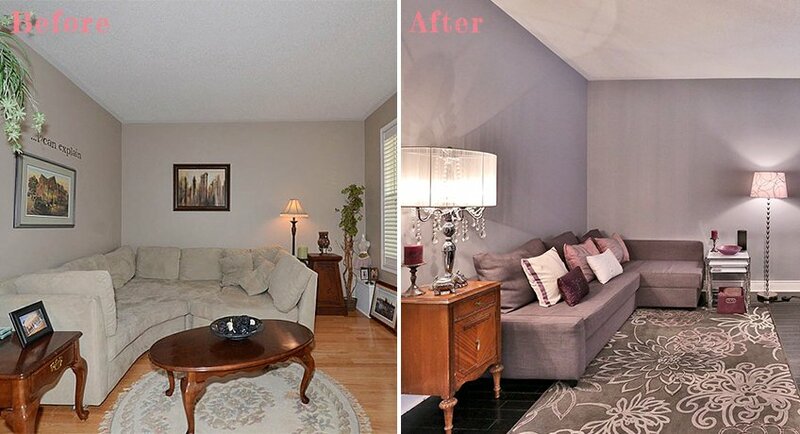 Here are some of the before and after shots of our reno. 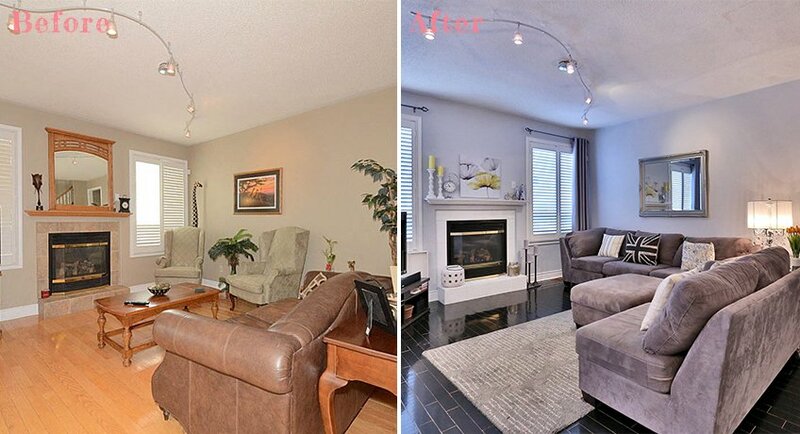 A Little Note: the before shots feature the previous owner’s decor and furnishings. While we left two of the taller bushes in the front, once we had widened the walkway, we realized we’d need to replace some of the other plants. I love the look of boxwood plants all in a row and I like that hostas provide greenery all summer long. 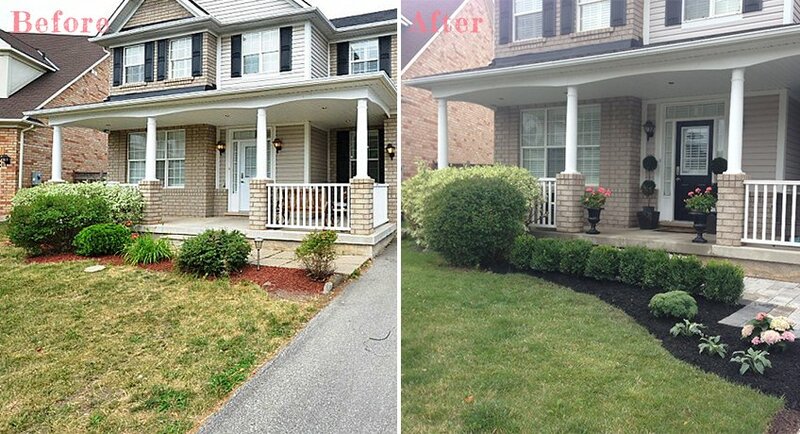 I painted the front door black to tie it in to the shutters and flanked the door with identical topiary plants. When we arrived, the grass had been fairly neglected and was full of weeds. Neither my husband or I have a green thumb…actually, the joke in our house is that we could kill a fake plant…that’s how bad we are with anything green, but we gave the grass our best shot. Back when these homes were first built in 2003, this shade of red was a very popular decor colour. By 2012…not so much. 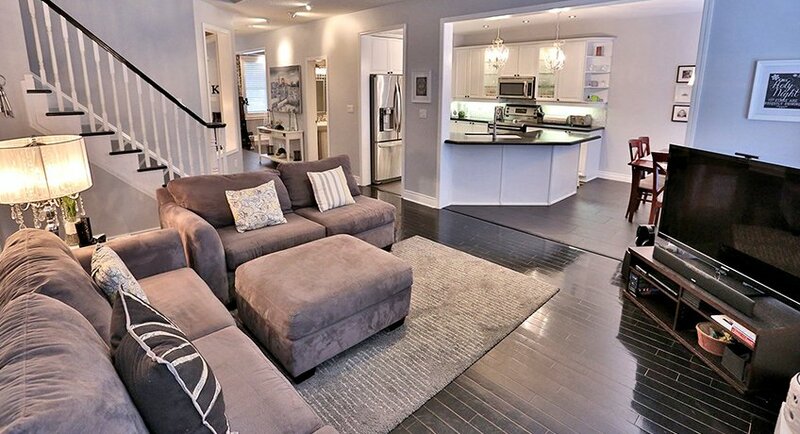 In this room we went with Behr’s “Gray Timber Wolf” (760E-3M) paint colour. We also had the floors sanded down and stained a custom colour. We enjoyed several family-and-friends get-togethers around our table. When we first moved in, this was my office which later got moved to the back of the house. We painted it the same colour as the dining room. About four months before we sold, we moved our IKEA Friheten sofa into the room and shifted some furniture around. (Our daughter and her new husband are enjoying this sofa now.) I didn’t end up getting to fully decorate this room, but here it is nonetheless. 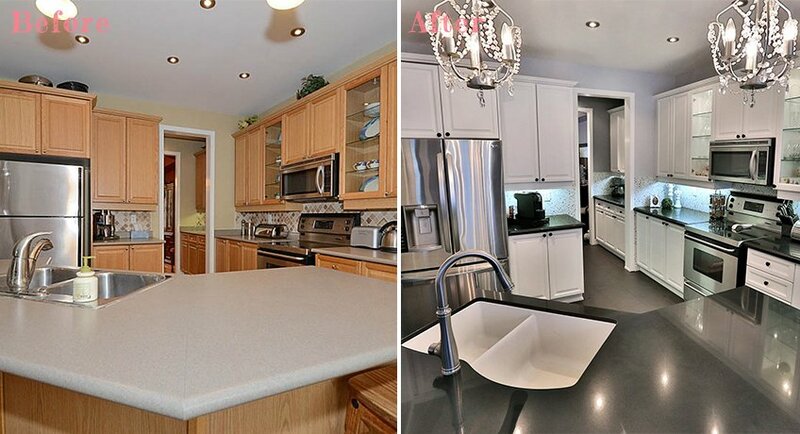 One of the things I really didn’t like when we were looking at this house was the kitchen. I’m not a fan of oak wood cabinets or green counter tops. So those were the first things to be changed. With all the other painting and renovations that were going on, we ended up hiring a company to paint the cupboards. We replaced the fridge, the flooring, the counter tops, sink, faucet, island lighting, backsplash, and the door knobs. The kitchen probably took the longest to complete and I’m not sure I’d ever want to do another kitchen renovation again, but it was worth it in the end. Although…lesson learned…I will never purchase a white sink or black counter tops again. Both seemed almost impossible to keep clean as every bit of dirt showed in the sink and every splash of water showed up on the counters. On a side note…another thing I really didn’t like were the floor tiles. When we had our home visit before we moved in, the owner seemed insulted that we were measuring to replace the tiles telling us that they had been an upgrade and were $10 a tile. But the tiles didn’t match a single thing we were going with and so out they came! 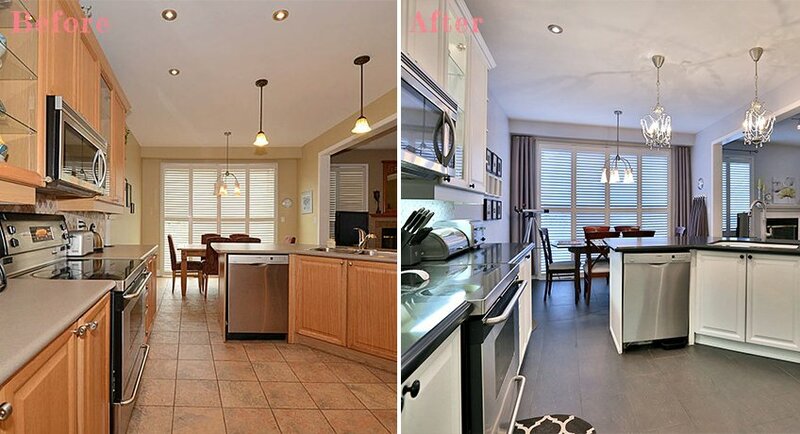 In the kitchen we used Behr’s “Manhattan Mist” (760E-2U) paint colour on the walls. 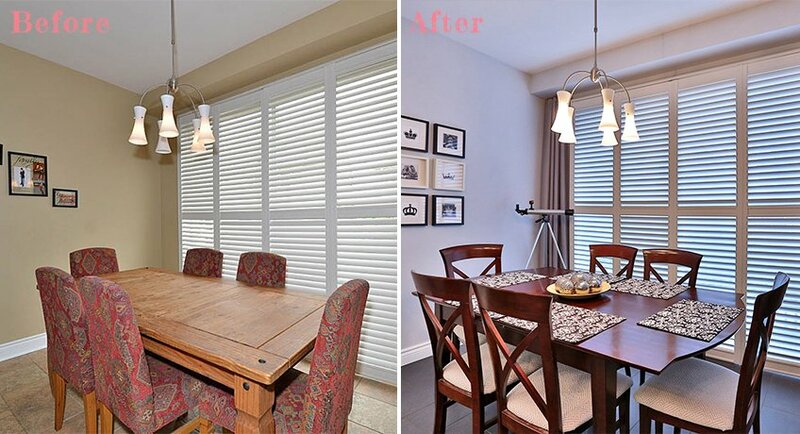 One of the things we did keep were the beautiful California shutters. In the Family Room, we painted the walls the same colour as the kitchen as the rooms were connected to one another. 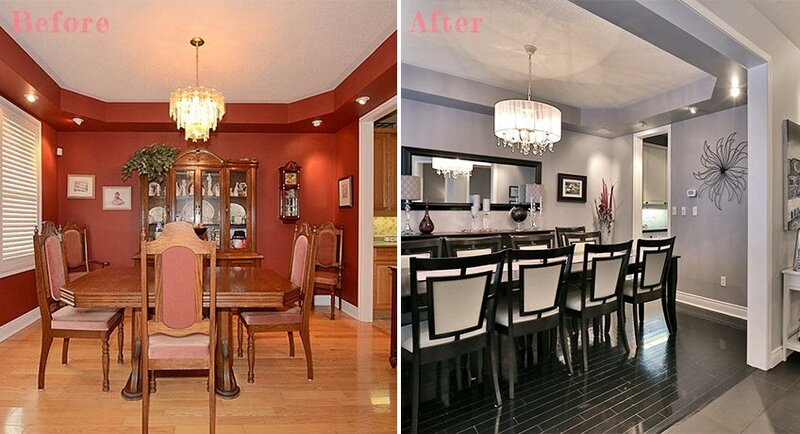 We had the floors sanded and stained in the same custom colour as the dining room. We painted the mantle and tile surrounding the fireplace in three coats of a semi-gloss white. And then I added small accents of yellow to the grey. 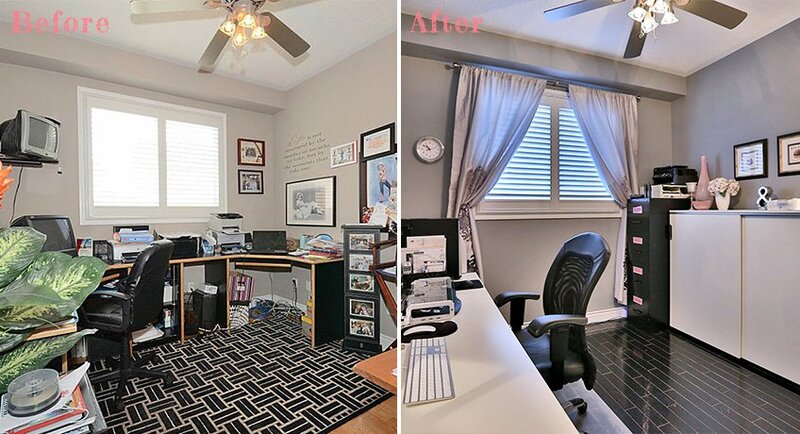 This had originally been my husband’s office but he moved his office down to the basement so I got to take it over. 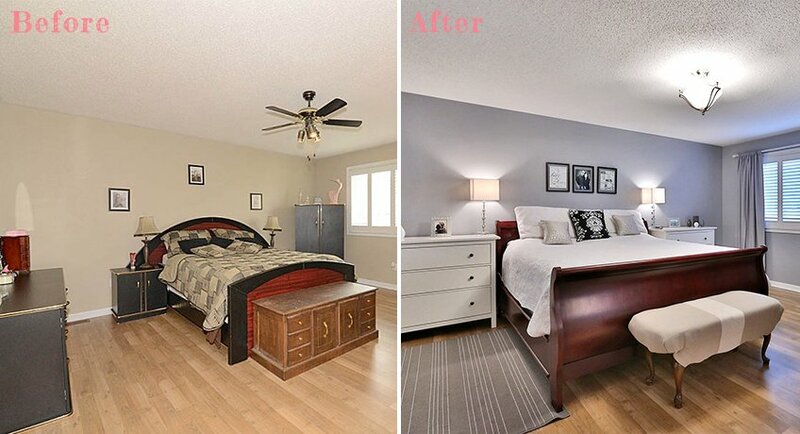 This was painted in Behr’s Gray Timber Wolf as well and the floors were also sanded and stained the same colour as all the other rooms with hardwood on the main floor. We replaced the flooring in our powder room with the same flooring as the rest of the tiled floors in our entrance and kitchen. 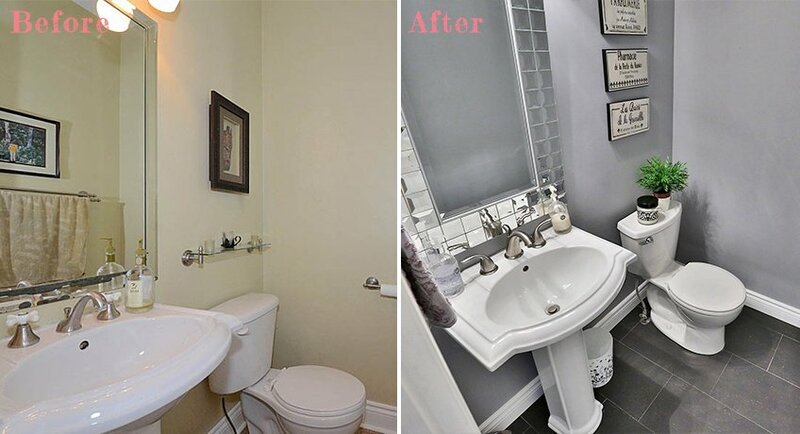 The paint colour is the same Gray Timber Wolf and I added a pretty mirror. Eventually the taps weren’t in the best working order and needed to be replaced. As you can probably tell, I really liked decorating this home with black, white and grey throughout the entire main floor…now onto the second storey of the house. Like I mentioned…I love grey and so we painted our bedroom the same Gray Timber Wolf as what was on much of the main floor. We never did get around to replacing the flooring here but I was happy with result of this room. This was the very last room to be painted and I was so happy to be rid of this colour. While my husband was a way on business one time, I decided to paint the cabinets and replace the door knobs as a surprise. 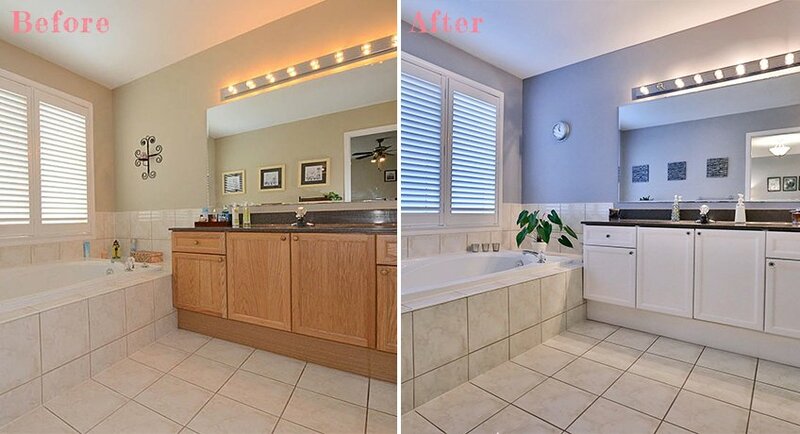 Ultimately it led to a much brighter looking room. This was our daughter’s room. 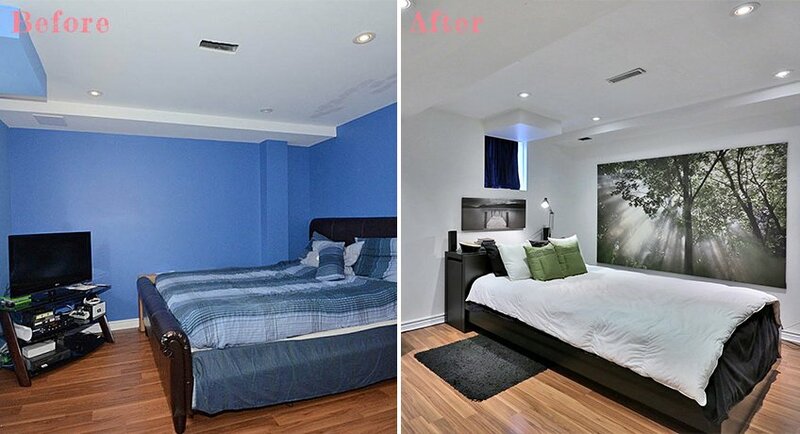 She loves the colour blue so we painted her room in Behr’s “Eminence” (550E-2M). I had noticed on her Pinterest boards, she kept saving this look of dangling lights and photos strung along the wire. So as one of her Christmas gifts one year, I bought two strings of dangling Christmas lights, then some garland with shiny baubles, some miniature clothes pegs and I printed off some of her favourite pictures to look like Polaroid photos and voila…soft lighting and wall decor all in one! It was a hit! This was used as our guest room and the wall colour was a custom colour blended to match the cushions I used in this room. Our son wanted a “man-cave” in the basement. He tends to run warm all the time and liked the cooler temperatures of the basement…plus it helped that he didn’t have to share a bathroom with his big sis anymore. He got to choose the colours of his room and decided on a bright white with accents of lime green.